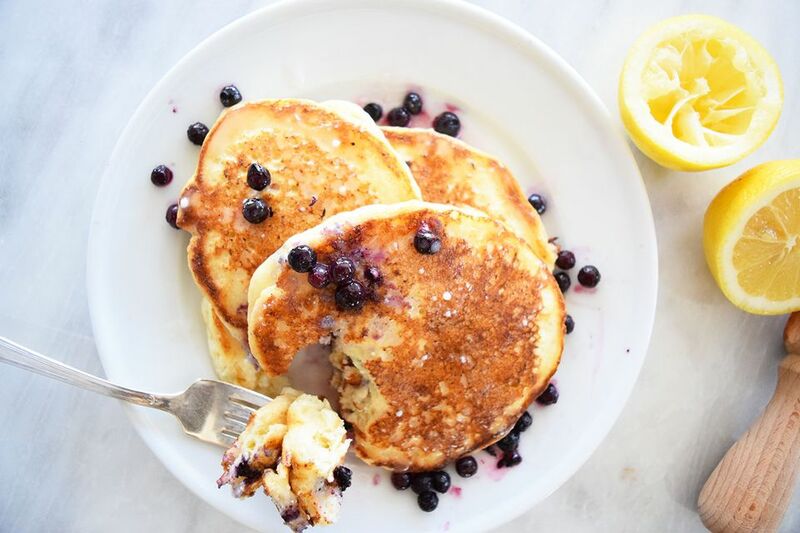 Be a brunch time master with these gorgeous blueberry lemon ricotta pancakes! Who knew that ricotta cheese could make a basic pancake recipe so elevated and chic? These pancakes are sweet, beautiful, and deliciously fluffy. It's all about the simple and perfect ingredients! Fresh eggs, in season blueberries, and buying a really nice ricotta cheese make for an amazing dish (we feel like Ina, when we say that ). Add in some fresh lemon zest and you've got zesty, sweet, decadent pancakes! These pancakes are really easy to mix together and are so much better than any box mix. You can replace the blueberries with other fruit, but there's something so amazing about mixing lemon together with blueberries! The super easy, homemade lemon syrup compliments the tangy wild blueberries and the soft, fluffy pancakes so nicely. Whip up mini versions of these pancakes for a fancy brunch, or make a batch of them for a decadent breakfast in bed for your hunny! Keep the pancakes warm in a 200 F oven while you are making the remaining pancakes. You can also freeze the left over pancakes on a large baking sheet. Once they are frozen, place them in a large ziplock bag. They are super tasty reheated in the toaster! Heat up a cast iron griddle or pan on medium heat before you begin. Make sure it gets nice and hot before you start cooking the pancakes. Beat together the egg, milk, ricotta cheese, lemon zest, vanilla and melted butter in a large measuring cup. Whisk the flour, baking powder, and salt in a separate bowl. Gradually add the wet mixture into the dry mixture. The dough will be a little lumpy. Let it sit for about five minutes. It will puff up, if it is too thick, add a little more milk. Add a generous amount of butter to the griddle, then lower the heat to a medium low temperature. Spoon large circles of batter onto the griddle. Cook on the griddle for a few minutes add blueberries to each pancake, and flip, cooking a few more minutes on the other side. A good rule of thumb is to wait until the bubbles stop popping and reforming on the raw side of the dough before flipping. Keep the pancakes warm in a 200 F oven while cooking the remaining cakes. Whisk together the lemon juice, powdered sugar, and milk in a small bowl. It it is too thin, add a little more powdered sugar. If it is too thick, add a little more milk! Heat slightly if desired. Drizzle the syrup over the pancakes and serve warm!